We offer interactive workshops and talks on devising theatre for schools and groups. We are able to tailor the sessions to the specific groups, generally focussing around the process of creating original theatre pieces. 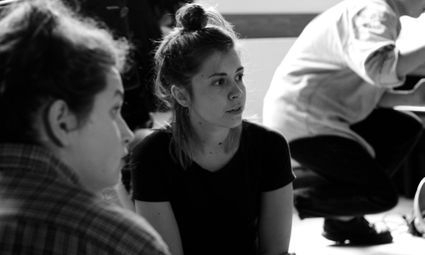 Our 1-2 hour devising workshop involves a practical portion, where the participants are split into small groups led by our members and supported to create ideas for a piece of their own. Our composers Wovoka Gentle are also on hand to discuss creating music for theatre and performance, and lighting designer Rachel Sampley will be able to advise on a career in technical theatre. We are also able to offer a show and a workshop package- where we perform one of our pieces at your school or venue followed by a workshop. We recently performed We Live By the Sea for groups at Aylesbury High, Buckinghamshire, followed by our interactive devising workshop. The students, many of whom were about to undertake the devising module of the AS level Drama, were able to gain a valuable insight into the process of creating original work from our company of trained actors and industry professionals.